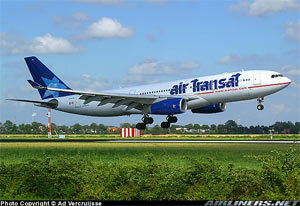 On August 24, 2001, Air Transat Flight TSC236, an Airbus Model 330-243 aircraft, was on a scheduled flight from Toronto, Canada to Lisbon, Portugal. A fuel leak in the Number 2 (right) engine began three hours 46 minutes into the flight that was not detected by the flight crew. Due to a developing fuel shortage, one hour and seven minutes after the fuel leak began, the flight crew initiated a diversion from the planned route for a landing at Lajes Airport on Terceira Island in the Azores. Approximately 150 nautical miles from Lajes Airport, the crew notified air traffic control that the right engine had flamed out. When the aircraft was about 65 nautical miles from the Lajes airport and at an altitude of about 34,500 feet, the crew reported that the left engine had also flamed out, and that a ditching at sea was possible. Assisted by radar vectors from Lajes air traffic control, the crew carried out an all-engine out visual approach and landing at night, in good visual weather conditions. The aircraft landed on runway 33 at the Lajes Airport at 06:45 Coordinated Universal Time (UTC). An emergency evacuation was conducted. Sixteen passengers and two cabin-crew members received injuries during the emergency evacuation. The aircraft suffered structural damage to the fuselage and to the main landing gear. The accident investigators determined that the fuel leak was caused by fuel line cracking that resulted from interference between the fuel line and a hydraulic line on the right engine. The interference was caused by an incomplete service bulletin incorporation creating a mismatch between the fuel and hydraulic lines during replacement of the right engine.